“Struttin’ With Some Barbecue” probably isn’t about food, but who cares? 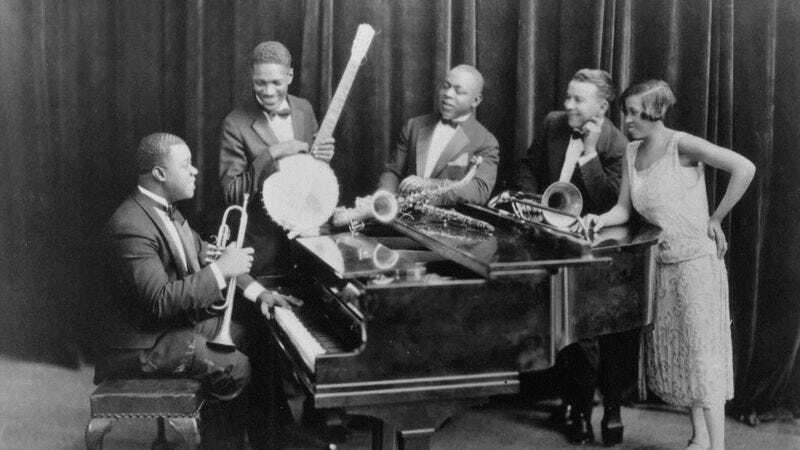 Although the man accomplished so much over the course of his legendary career, my favorite Louis Armstrong era is early. I’ll take anything from the Hot Fives & Sevens compilation over pretty much everything else, particularly “What A Wonderful World” or “Hello, Dolly!” Though known more for his distinctive voice, Armstrong was also an incredible player, and those early Dixieland songs really show his skill, both as a musician and a bandleader. Despite Raye’s references to “pickin’ on a juicy rib,” Armstrong probably wasn’t talking about food back in 1927. The site amazingribs.com (!!) notes that Cab Calloway’s Jive Dictionary defines “barbecue” as slang for a good-looking lady. That makes a lot more sense when it comes to strutting, as no one, not even Satchmo, can look like a badass while eating ribs. Even if it’s not about food, “Struttin’ With Some Barbecue” is one of the great song titles of all time. Armstrong is in fine form, playing a bright, hooky melody that guides the song. (He also has a pretty great solo, as does clarinetist Johnny Dodds.) “Struttin’ With Some Barbecue” is three minutes of joy among some other amusingly titled tracks from that era, like “Big Butter And Egg Man From The West,” “Potato Head Blues,” and “Beau Koo Jack.” Let them all soundtrack your next barbecue.